After such a slow start to the season with no Fall Battle Roads, the season has certainly picked up and time seems to be flying. It seems like I’ve played in at least one Pokemon tournament each weekend for most of the last month and a half. City Championships are wrapping up, and Regional Championships have crept upon us and kick off this weekend with the Virginia Regional Championships. I won’t be attending a Regional Championship this weekend, but I will be attending two City Championships this weekend. I still have some work to do in regards to City Championships, as I have yet to hit my best finish limit. As of now, I have received 110 points from City Championships – 50 points for my first place finish, and 30 points each for my two third place finishes. My goal for this weekend is simple, just get more points via a Top 4. A top 4 finish would put me at 140 points total from City Championships minimum, and 180 championships total. If I can do well on Saturday, I’ll also have the chance to improve on one of my third place finishes by making the finals at the Sunday tournament. The best I can finish from City Championships is 180 points if I manage the miracle of two first place finishes, but really, just one Top 4 is the goal for this weekend. At 180 points total for the season, I will be well positioned headed into the next sections of the season. I haven’t had the opportunity to play in many league challenges, so there will be plenty of points to be gained there, and with that, a solid States/Regionals run should securely put me in position to receive a Travel Reward for Nationals, as well as give me a shot at qualifying for the World Championships with a good run at Nationals. I’ll be playing in one Regional Championship this winter, the St. Louis Regional Championship during the second weekend of Winter Regionals. I think an important step to take in preparing for a large tournament is to look at your past deck choices and results from big tournaments before deciding on choosing which deck you think will give you the best shot at performing well. At my first Regional Championship during my rookie season, I played a Tyranitar Prime/Vileplume/Reuinicus deck. 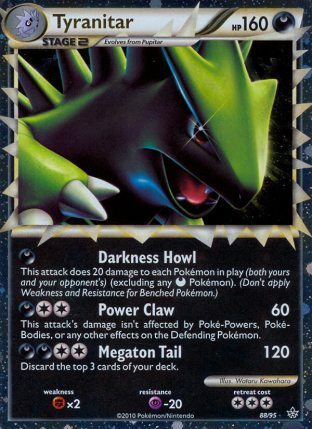 At the time, most Pokemon had a damage cap of 120, and most Pokemon had 140 HP or less, with a lot of popular attackers sitting at 130 HP. This deck allowed me to tank my Tyranitar Prime with its massive 160 HP, and with a Special Darkness Energy attached it hit for 130, and for two it hit for 140 damage, good to OHKO everything. I ended the tournament 4-4, which was a solid result for having no idea about there being a meta game, or having any idea of what other decks people would play. I actually would have made the top cut if I had won my last match. It would have been super exciting to have cracked into the cut at my first large event, but luck wasn’t on my side, as I literally Eeeked with my Cleffa/played Supporters turn after turn, just needing to draw into my Reuiniclus (none of which were prized) to have the dominant board state, but just couldn’t do that and lost as a result. At Nationals that year, I played a Darkrai EX/Chandelure NVI deck, which is very similar to the concept that current Darkrai/Laser builds are built around. 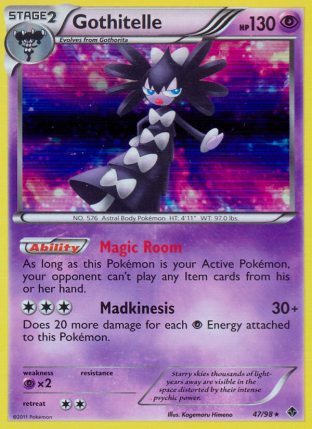 The idea of the deck was to accelerate damage with Chandelure NVI. The snipe from Night Spear (30) + a Dark Clawed Night Spear (110) + Cursed Shadow (30) hit 170 HP, which was very significant for that format. Sometimes it could even get off two Cursed Shadow in a turn, which just further accelerated the damage. I ended up 5-4, misplaying myself out of a game due to nervousness and losing my last match to a donk. At Fall Regional Championships the following year, I played a Darkrai EX/Garbodor deck that my friend Colin devised. The deck did a good job countering most of the format but it struggled against the Darkrai/Terrakion decks that seemed to be the main play for that weekend. The deck relied on Hammers at the time. It was interesting to see the deck start having success again around Nationals. Getting a few new cards like Hypnotoxic Laser and Float Stone really helped the deck out. I ended up 5-4, again not good enough for cut. At Winter Regional Championships, I played a fairly standard Big Basics deck and went 2-5 drop for what was probably my worst tournament ever. 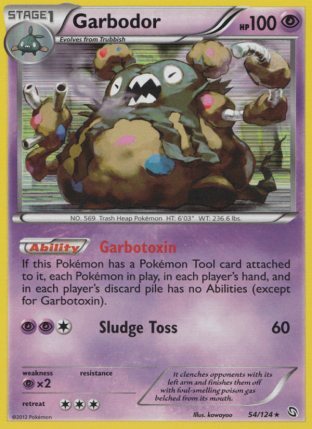 It was a poor meta game choice for the day, and I ignored the testing results that showed a poor Blastoise matchup in favor of the theory of how the deck could beat Blastoise. 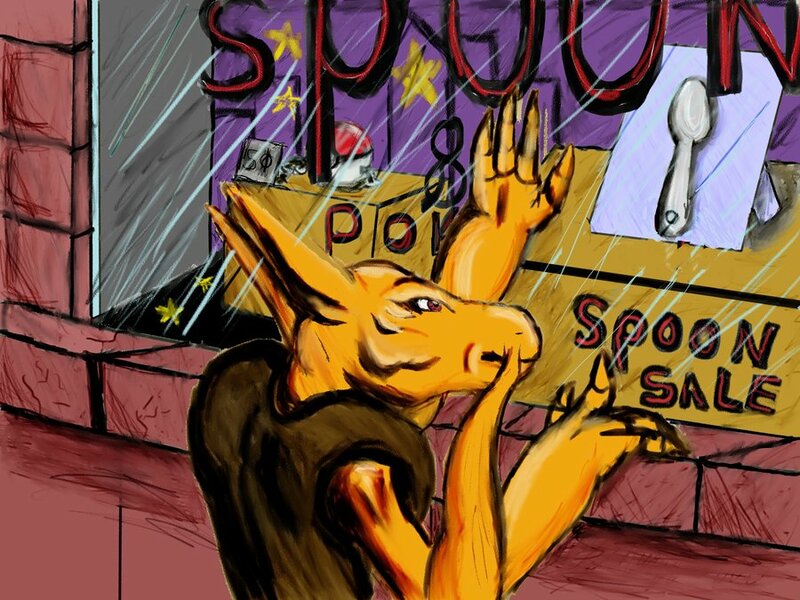 I finally found success at the National Championship that year playing a Sableye/Garbodor deck that just relied on using Junk Hunt every turn, Hammering away their Energy and using Laser to stack damage for KO’s. It was a solid meta call for the tournament as most players didn’t play Tool Scrapper in their decks, but overall it had no chance of winning the actual tournament because of the showing of Gothitelle. I ended up going 6-3 before losing in Top 128. At Fall Regional Championships this season, I played Virizion EX/Genesect EX/Mewtwo EX. I went 6-1-2 in the initial swiss rounds, but had a poor Top 32 showing going 1-3-1, finishing 24th overall. I think in regards to Fall Regional Championships, I would have done better if I had gotten to play in an earlier Regional Championship. 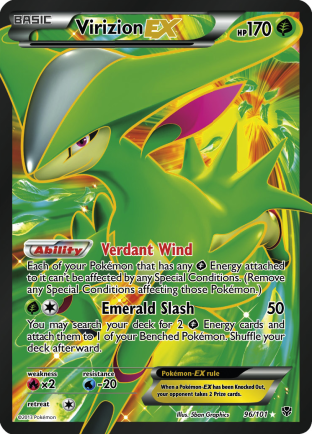 Fort Wayne was during the third weekend of Regional Championships, and all that time I was just sitting on the deck hoping no one figured out how strong of a deck Virizion EX decks were. I was really hoping for a meta game full of bad Virizion decks and the other decks, but the cat got out of the bag on how to build a good Virizion deck by week 3. As a result, all 4 of my losses that weekend were to other Virizion decks! Regional Championships always come at the end of a format, which means there will be an established meta game for Regional Championships, outside of odd cases like this past Fall where we had no tournaments before Regionals. As a result of this, there is an established meta game headed into Regional Championships. This is important, because it gives us a frame of reference in regards to the format. As a result, we have information to build our decks upon to strengthen its matchups against given decks or to build whole new decks aimed at countering the established meta game. Personally, I think the larger tournaments are best responded to by making our statement in regards to the format. The format can just be looked at as a set of problems that need to be solved, and the way we solve those problems is by creating a deck that specifically addresses each problem (or deck) in the format. As you can see from my past deck choices at big tournaments, I believe it to be best to play something off the beaten path that attempts to exploit the other decks in the existing format. I think doing so gives you the best individual probability of winning the tournament. That’s not to say that the meta decks won’t just win the tournament, but I don’t think you are generally giving yourself the best probability of winning the tournament yourself. You may choose to play Virizion EX/Genesect EX and that ends up winning the tournament, but what is going to set you apart from the other Virizion players to make sure you win the tournament? I feel if you’re choosing to go about the tournament in that manner, you’re leaving your tournament result too much up to luck as the Virizion decks that get the best draws and most favorable matchups during Swiss will be the ones to perform best. I don’t think it’s a shock that we often see decks that not many players are playing take home a big tournament like this. For example, at my first Regional Championship, some reimagined meta decks ended up winning some of these tournaments, such as Magnezone/Typhlosion or Kingdra/Typhlosion which moved beyond just the standard meta decks of Typhlosion/Reshiram. The former decks gave themselves a competitive advantage that the latter lacked. Decks like Klinklang and Gothitelle were known about but slept on headed into their respective National Championships before they won it. Just at this past Regionals, we saw the Big Tex deck win a tournament, as it countered the format well. The best approach is to explore rogue options headed into Regionals, and if none are working, evaluate which meta deck gives you the best matchups against the top decks, and then figure out what you can do to push the mirror in your favor without sacrificing your other matchups. I think with all of the results we have from City Championships, some clear observations about the current format can be made. Looking at the results from City Championships, I think it is clear that Virizion EX/Genesect EX, Darkrai EX/Garbodor, Plasma, Blastoise, and Emboar are the Top 5 decks in this format. As a result, we can expect them to see the bulk of play. The other two fringe decks towards the top are Empoleon and Gothitelle/Accelgor decks, neither of which I would expect to see much play. Empoleon suffers from a bad Plasma and Darkrai/Garbodor matchup, while Gothitelle/Accelgor decks have an autoloss to Virizion decks, and Virizion has been the BDIF during City Championships. Because of this, these will be poor choices for the tournament and should see little play and the ones that do see play will probably sink to the lower part of the standings. Based on those top 5 decks, the main counters we are likely to see are Fire Pokemon, Fighting Pokemon, Drifblim, Silver Mirror, Leafeon, and Garbodor based strategies. From here, we have the information of which to evaluate the format – the decks that will see the most play, and the counter decks that other players are most likely to play to combat the established format. From both sets of information are what we should take into account when picking our deck for the tournament. I am preparing for St. Louis Regional Championships to be a 9 round Swiss tournament, with an initial cut down to a Top 32 for Day 2, followed by a Top 8 cut after five additional Swiss rounds. In preparing for this, I want to create a good idea of what will get me into each portion of the tournament. At Fort Wayne Regional Championships, 18 points was the bubble for making it into the Top 32, with 19 allowing you to safely make it in. 28 points was the bubble for the Top 8 cut, with 29 points allowing you to safely make it in. I couldn’t find the Top 32 data for Texas or Philadelphia Regionals, but 29 points was the cut off for Top 8 at Texas Regionals while 31 points was the cut off at Philly. Given that Fort Wayne and Texas had the same cut off, I think they’re probably good frames of reference for what it’ll take to make it at each tournament, as that’s about what I expect the attendance to be at St. Louis. To get to 18 points means that you need to go 6-3 or 5-1-3. 19 points means you need a record of 6-2-1 or 5-0-4. The latter are the goals we really want to focus on, as those are the records needed to continue onto Day 2. So at 19 points, what do we need to do to continue on to the Top 8 cut? Well given 29 points was the cutoff, we just need 10 more points in order to make it into the Top 8 cut. That means, if you’re near the bottom headed into the Top 32, if you go 3-1-1, 3-0-2, 4-1, 4-0-1, or 5-0 will get you into cut. If you bubble in at 18 points, you will need 11 points, which means a record of 3-0-2, 4-1, 4-0-1, or 5-0 will get you into cut. This is very manageable, as those are the records that will typically get you into cut at a City Championship. As a result, if you find yourself in a position to get into the Top 32 based on an intentional draw, I would take that over risking your spot in the Top 32, as a reasonable performance on day 2 will get you into the Top 8 cut. If you find yourself towards the top of the standings during the initial swiss rounds, then I think playing it out to try to earn more points is the right decision, but otherwise, I think just ensuring your spot in Top 32 is the more rational choice. I hope this article helps you out as you prepare for Regional Championships. I’m pretty eager to play in the St. Louis one next weekend. I am 90 percent certain of my deck choice for the tournament and hope to do well! Great article. Been enjoying most of the articles on the site. I’m new at the game, just started with LTR, and soaking up as much as I can. Good luck at the regionals!